Fall is the best time to plant Trees & Shrubs. For a short time, Gardening Partners will have limited quantities available of selected plants for sale. Local pickup only. Call 615 375 6675 to purchase and arrange pickup. Water – medium. Low maint. Street/lawn/shade tree. Tolerates deer, clay soil, air pollution, heat, saline conditions, alkaline, acidic, and compacted soils. No serious problems. Slow growing. Two-lobed, leather fan-shaped leaves with almost parallel veins – bright yellow in fall. Male trees are desired as fruit has a foul odor. Hgt. 30 to 50 ft. Spread 30 to 50 ft.
Bloom March to April. Yellowish-green. Showy Edible Fruit. Attracts birds. Medium water. Medium maint. Prune in late fall or winter. Shallow rooted. Tolerates head, drought, air pollution, wide range of soils including alkaline. Bloom – June to August Showy pink flower. Showy purple fruit in clusters along the stem. Attracts birds. Medium water. Low maintenance. Works well as a hedge plant, in borders, and in bird gardens. Prune as needed in early spring. No serious problems – may die back in harsh winters. Click here to see an example of mature plant. Categories: Uncategorized | Tags: $15, 2018, beautyberry, fall sale, gingko biloba, maidenhair tree, mulberry | Permalink. Tours still being booked – complete schedule available soon. Students accepted as space allows until September 25th. 2018 Fall Gardening Classes will begin September 11. Graduation is scheduled for November 13. Tuesday evening classes between those two dates are packed with information and instruction. Saturday morning tours are planned to educate and excite new and experienced gardeners alike. This year, for the first time, Gardening Partners will be offering online instruction as well with extra material presented on selected gardening topics. Evening classes typically begin at 6 pm and end by 8:15 pm while Saturday tours generally begin around 9 or 10 am and end before noon. Sunday afternoon tours begin around 12 to 1 pm. Each class will present a general overview of one topic. Classes are designed to introduce information and resources for further study. Our instructors may use handouts, PowerPoints, lectures, videos, and other materials. Gardening Partners endeavors to provide the best instruction available from instructors who bring their expertise and experience to the classroom. Amy is the UT/ TSU Horticulture Extension Agent for Williamson County, Tennessee and is a graduate of Auburn University, where she received a Bachelor of Liberal Arts, a Bachelor of Science in Horticulture and a Master of Agriculture in Plant Pathology & Entomology. She provides educational training for both homeowner and commercial clientele regarding issues concerning horticulture, conducts site visits throughout the county to diagnose and resolve issues with insects, plant diseases, soil and weeds, and is a frequent guest speaker for professional, garden and horticultural associations and commercial pesticide workshops/conferences. Amy also coordinates the Williamson County Master Gardener Program. Dr. David Cook is a University of Tennessee Extension Agent for Davidson County and is involved in educating homeowner and commercial clients about issues concerning horticulture and agriculture. He provides educational training on pesticide safety and training for pesticide applicators seeking commercial certification and licensing and teaches training classes for Master Gardener programs in Davidson and surrounding counties. He is a frequent guest speaker for garden clubs, horticultural associations, and commercial pesticide workshops. Marty’s lifelong passion for plants has led her to a long and varied career in horticulture: she’s been a professional grower of gloxinias and African violets as well as perennials, a native plant propagator, a landscaper and landscape designer. She deeply enjoys learning constantly and sharing what she learns about plants, particularly information and techniques that can produce thriving plants and green-thumbed gardeners. Linda Hartmann is a Middle School Science and Math teacher with 35 years experience, most of those years in Florida with the Escambia County School District. She has Master’s degree in Education. In the year 2000, she was selected as the Escambia County Teacher of the Year, as well as the WSRE-TV’s National Teacher Training Institute Teacher of the Year. While she was the senior science teacher at the school district’s Environmental Center she had the opportunity to work in cooperation with the Wildlife Sanctuary of Northwest Florida to learn how to handle wildlife, specifically, hawks and owls. Other projects included classroom lessons on ecology, environmental sustainability, recycling, and habitat restoration. Linda was also actively involved in several state environmental groups developing many environmental education programs that were to be used in classrooms. One of these programs was to teach about sustainable vermicomposting, that is, using earthworms to compost organic waste into rich, fertile soil eliminating the use of chemical fertilizers. Having moved to TN to be near her sister Dorothy, Linda now lives in Vanleer, TN, enjoying retirement with her dog, Buddy, and visits with her son, Jimmy and grandson Max. Jim Johnson is retired from the Agricultural Extension Service where he conducted programs in agriculture and horticulture, including the Davidson County Master Gardener Program. Jim currently owns and operates Prime Lawns, a landscape pest control service. He lives in Hermitage, TN with his wife Cindy. They have 3 grown children. Categories: Uncategorized | Tags: 2018, amy dismukes, class, fall, instructors, jim johnson, linda hartmann, marty dehart, registration, troy marden, vegetable | Permalink. Gardening Partners has 15 varieties of Basil growing for Plant Sale 2018. The varieties and their descriptions are listed below….we will add varieties to the list every few days, so check back for updates. Sweet Basil Ocimum basilicum ~ A tender annual growing 24 to 30 inches tall, space 18 inches apart in full sun. Plant after all danger of frost has passed. Great for containers. 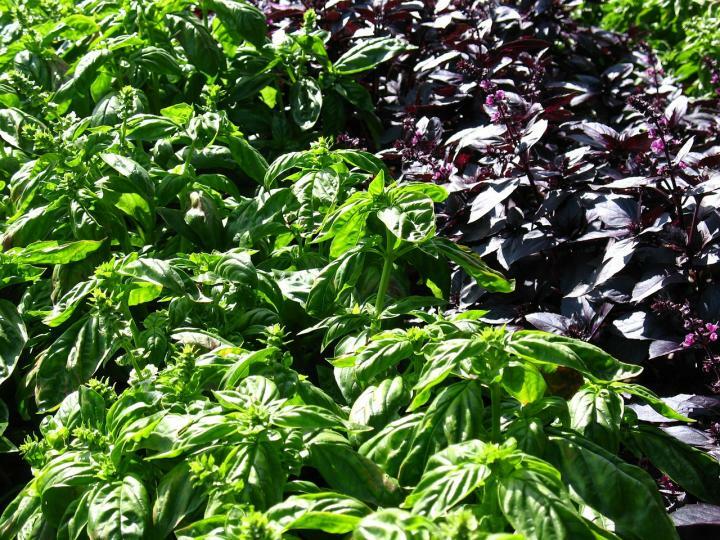 Sweet basil is probably the most common of the basils and is very popular in pesto, salads, and marinades. Sweet Basil is usually the one found in grocery stores. Sweet Basil is a medium green color with a rounded cup-shaped leaf. Sweet Basil has been known to repel mosquitos. One or two plants is usually enough for a family, but if you plan to make pesto, you’ll need more. You can begin harvesting leaves when the plant reaches 6 to 8 inches tall. Harvest regularly to encourage growth. Genovese Basil ~ Genovese is the classic Italian basil with extra-large dark green crinkled leaves about 3 inches long. This Basil is tall (24 to 30 inches), slow to bolt, and another excellent basil to use in pestos and Italian dishes ~ especially insalata caprese. The leaves of Genovese are flatter than Sweet basil with a more pointed shape. Genovese is a cultivar of Sweet Basil and has a stronger more aromatic flavor with less tendency to become bitter after long periods of cooking. Siam Queen ~ Thai Basil with strong clove-like flavor. Leaves are medium green and up to 2 inches long with an intense licorice/basil aroma. It is an attractive garden plant with red purple flowers in clusters. Grows well in sun with average water needs – great for containers and good bolt resistance. Spectacular grown in large groupings. Space plants 6 to 12 inches apart after frost danger has passed. Siam Queen grows 2 feet tall and can be harvested starting at 60 days. Pick leaves in the early morning for best flavor – use fresh or freeze in plastic bags. Dry by hanging bundles upside down in a dark room with good ventilation, then store in airtight jars. A staple in Thai and Vietnamese cuisine, it is also suited for stir-fries, curry and other regional dishes. Basil Minette ~ a compact uniformly globe-shaped basil that keeps its shape all summer. This variety grows to 10 inches high with small leaves only ½ inch long. This basil loves hot weather and plenty of sun but needs uniform moisture. Flavorful leaves can be used fresh or dried in tomato-based recipes, pasta sauces, vegetable dishes and soups. Pinch off the flower buds if you plan to harvest the leaves for cooking. If freezing for later use, harvest the entire stem with the leaves still attached. Many garden uses as a companion plant, edging, miniature gardens or in containers. Thai Sweet Basil ~ Thai Basil has smaller dark pointed leaves and has a spicy, licorice flavor. Used often in spicy Asian recipes, Thai Basil keeps its flavor at higher cooking temperatures as compared to other types of Basil. Dark Opal Purple Basil grows 18 inches tall. A few plants (about 20%) will be variegated or green plants making for a nice color contrast in the garden. Purple basils have a striking dark color and the flavor is not as sweet as other basils with a strong clove taste. Steeped in oil or vinegar, it brings a lovely color to recipes. It has large leaves that average 1 to 2 when fully grown. Maturity in 80 days. Lemon Basil grows 12 and 18 inches tall with lighter green leaves. Crushed leaves give off a strong lemony scent. Use Lemon Basil in marinades for fish or poultry, on grilled vegetables, in desserts and even teas. Lime Basil has a sweet and mild citrus flavor. The leaves are bright green with a narrow shape. Lime basil grows between 16 and 24 inches tall. Pair with Lemon Basil for cooking in sauces, dessert dishes, and teas. Lettuce Leaf Basil has a distinctive appearance with large wrinkled leaves which work salads and fresh dishes. The leaves of the lettuce basil are four inches wide and between six and ten inches long making it an excellent substitute in lettuce wraps. This is a mild flavored Italian Basil. The leaves may be large, but the plant is compact growing only a foot high. Slow to flower, it lasts a bit longer in the garden before bolting. Cinnamon Basil is a spicy, fragrant variety of basil and a lovely addition to the herb garden. The stems are a red to purple color with pink flowers at maturity. Cinnamon Basil has a milder basil flavor and works well with fruit. Also used in Asian cooking, marinades, fried rice, salads, and grilled vegetables. Spicy Globe Basil ~ Spicy Globe is a dwarf basil variety with a strong, spicy flavor. Smaller leaves can be served whole in soup, salad, or pasta. Sometimes called Spicy Bush Basil, it forms a clump when growing. Good choice for container growing. Marseille ~ a French heirloom Basil typically used in pistou, the Provençal version of pesto. Marseille is a dwarf compact 12 inch tall bush variety with large tender sweet leaves, strong basil flavor, excellent for pesto and seasoning. Dries well. Large Leaf Italian ~ Authentic Neapolitan Basil for Italian cuisine, use it fresh or dried. Medium to Large Leaves up to 4 inches long. Very fragrant and prolific. Repels aphids, mites and tomato hornworms in the garden. Sweeter than Genovese, use it for Italian recipes and to accent fish, poultry, rice, mild vegetables and salads, serve with fresh mozzarella or make Basil Vinegar. Mrs, Burns’ Lemon Basil ~ an heirloom variety with bigger leaves than any other lemon basil, it has a delicious lemon scent. Robust plants grow 12 to 18 inches tall with small green leaves and white edible flowers. Dries very well. Intense lemon flavor is popular with chefs to flavor seafood dishes and to make vinegars. Dolce Vita Blend ~ a mix of basils, each plant may be of a different variety. Dolce Fresca ~ New introduction Genovese style Basil. 2015 All-America Selections award winner. Dark green glossy leaves great for pesto or caprese. Sweet and fragrant compact plants grow 10 to 14 inches tall and spread 10 to 12 inches. Continuous harvest until late season. Sweet Dani Lemon Basil ~ An All-American Selection winner in 1998. Citrusy, large-leaved, and fast growing – reaching over 2 feet in height. The leaves contain up to 75% more essential oils than other lemon basils. Use in vinegars, fish dishes, salads, and teas. Categories: Uncategorized | Tags: 2018, basil, plant sale | Permalink. Dickson County Cancer Auction 2018 will be kicking off soon. Every Monday-Saturday during April in the War Memorial Building! Gardening Partners day at the auction is April 24th. Volunteers will be needed on our day to answer phones and keep the auction board up to date ~ members will be able to sign up at the April meeting. If you plan to donate an item as a Gardening Partners member, April 24th is the day to do so. Send in photos of your donation and we will promote it on our website and social media accounts. We will be working on mixed pots at the Montgomery Bell Greenhouse as a direct donation from Gardening Partners. Categories: Uncategorized | Tags: 2018, April, auction, cancer, volunteer | Permalink.